Renesola and Trina Solar are lowest cost Chinese solar panel manufacturers globally. Renesola is a vertically integrated company with complete R&D and manufacturing of polysilicon, silicon wafer and solar modules. Renesola has a global presence with sales branches established in Europe, the Americas and the Asia-Pacific regions. Trina Solar on the other hand is a vertically integrated company right from the production of ingots to modules. Trina Solar was founded in 1997, with 12 offices worldwide, Trina Solar has partnerships with leading installers, distributors, utilities and developers in all major PV markets and is listed on the NYSE. Trina Solar is one of the world’s foremost PV companies. Fully vertically integrated from the production of ingots to modules into both mono and multicrystalline technologies. Renesola sells solar panels as an OEM Solar Panel Producer which means that it sells its solar panels to companies who put their own brand names on solar panels produced by Renesola. Renesola come in Monocrystalline and multicrystalline make. Trina Solar has a further classification for convenience into: Business Need – Commercial, Residential & Utility. The different monocrystalline solar modules from Renesola are: i) 156 black mono (250w-260w), ii) 125mono (190w-200w), iii) 156square mono (260w-270w) and iv) 156mono (250w-260w). 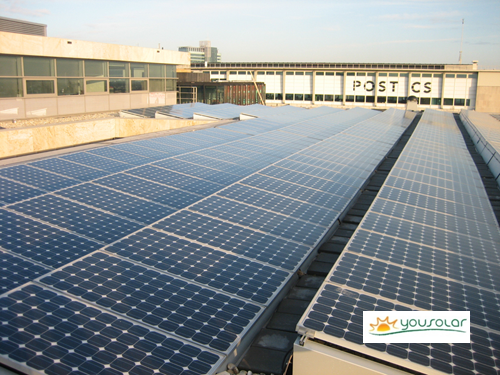 The multicrystalline solar modules from Renesola are: VIRTUS VIRTUS II series. While Trina Solar offers i) PA05: 60 cell Universal (residential, commercial and utility) ii) PD05: 60 cell Dual Glass (residential, commercial and utility) iii) PA14: 72 cell Utility, iv) PD14: 72 cell Utility under multicrystalline make. The cell types found in Renesola are 125×125 mm and 156×156 mm, whereas in Trina Solar they are 125×125 mm in monocrystalline modules and 156×156 mm in multicrystalline modules. The solar modules’ wattage for Trina Solar range between 240 W – 305 W, for Renesola modules the wattage range is 190 W – 310 W.
Both Trina Solar and Renesola Solar modules have frames made of Anodized Aluminum Alloy. Weight for Renesola modules are 16 kg, 19 kg, 29 kg whereas for Trina Solar modules it is 15.6kg for monocrystalline panels and 19.5 kg and 28 kg for multicrystalline modules. Both Trina Solar modules have a power output ~0-+3% and Renesola Modules come with a positive power tolerance of 0-+5W. Renesola Modules confirm with PV standards such as IEC 61215:2005, IEC 61730:2004, UL 1703, whereas Trina Solar Modules are manufactured according to international Quality and environment Management System Standards ISO9001, ISO14001. Trina Solar come with a 10 years product warranty & 25 years linear power warranty. Renesola modules have a limited product warranty – 10 years repair, replacement or refund remedy and 25 years limited peak power warranty – limited remedy. For other technical details, you can look into the respective websites of Renesola and Trina Solar.